Biafra: Examining Buhari's Level Of Madness And The Cure: Yes Master Kanu, Indeed Buhari Is Raving Mad!!! I have tried so hard to unravel the mystery surrounding the man that is now perceived to be a very big boil on Buhari's scrotum, but all to no avail. I keep trying to understand what kind of leader Mazi Nnamdi Kanu is, but the more I seem to have understood him the more he surprises me with a whole new thought provoking attributes. Right from the days when he use to preach his gospel of freedom on Radio Biafra till date in which he is undergoing several ordeals arising from his sermon, he has been a leader per excellence. Prior to his incarceration, he had warned Biafrans to be "whiter than white" and “fearless before her enemies". This he has not just preached like Yeshua, rather he has practiced it by setting the pace. All the prophetic words of Nnamdi Kanu has made the fools appear more foolish and added more wisdom to the wise. The fools prior to his arrest, tagged his words "vain talk", "abusive", “war mongering" and "hate speech", but what they are yet to dispute is the manifestation of those painful truth in Nigeria today. A lot of them are beginning to see that he was right after all. According to Fani Kayode " Nnamdi Kanu is a prophet, who saw what others were too blinded to see." During his last appearance at the federal high court in Abuja, the IPOB leader summed up Binta Nyako's ruling as unethical after being suborned by Buhari, prompting her to transform into the prosecuting counsel instead of a presiding judge; Nnamdi Kanu without fear lambasted her and further described her paymaster as a " mad man" and ordered her to go and tell his master that he cannot be intimidated like herself (Binta) and the other judges. The level of madness that is currently running within Nigeria and inside those who claim to be her leaders is of an unimaginable proportion. Let us take a look at the highlighted level of madness in Aso Rock and decipher if they will ever be cured of this terrible ailment. Read also: BIAFRA: NNAMDI KANU WAS ACCUSED OPENLY, THEREFORE WE SAY "NO TO SECRET TRIAL"-- IPOB CHARGES. The move to arrest Nnamdi Kanu was the first madness exhibited by the current Nigerian President, Muhammadu Buhari. It is only a mad man that stands against what he preaches. President Buhari has been touring the world campaigning for the independence of the state of Palestine and that of Western Sahara, while at the same time arrested Nnamdi Kanu for asking for a sovereign state of Biafra. What madness is greater than that the exhibition of such hypocrisy? Buhari can only confirm his sanity if it can be proven that he was induced with drug as at the time he was advocating for self determination of the aforementioned entity. Buhari's desire to continue to cohabit with Biafrans when he and his kinsmen derive great joy in marginalizing and killing them is outright madness. It is only a mad man that doesn't mind having anybody, including those that disgusts him within his territory due to a mental disorder. Buhari or anyone who thinks that those who deserve 5% attention, despite being the bed rock of the economy in Nigeria will continue to stay with him is just very mad. It is unfathomable how Biafrans are expected to live in Nigeria with Hausa-Fulani savages that is threatening her existence as a race with all manner of impunity. Buhari or anybody thinking along such line requires rapid psychological attention, because it is a more serious case than the ear infection which the Nigerian dictator is currently suffering from. It is only a mad man who chases a rat while his house is on fire. Buhari and his friends are running after Biafrans while the Nigerian economy keeps going down the drain. Unemployment has risen alarmingly, oil production down by 80%, security agencies are demotivated as Boko Haram whom they claim have been technically defeated is still having fun hunting down humans in the north and worst still the supposed army is not left out from the hunt, inflation has risen more than 200% and loss of lives have become uncountable in the middle belt and eastern region due to Fulani herdsmen menace. Which sound minded fellow will be chasing other things when his country is in such a terrible state? That is a clear point that Buhari is not just mad but "raving mad"; anyway Nnamdi foretold already that Somalia will be better than Nigeria and from all indication it is heading towards the direction. Read also: BIAFRA: AS THE COWARDLY NIGERIAN ARMY/ PYTHON CONTINUES TO DANCE IN BIAFRALAND, BOKO HARAM GAINS GROUND IN AREWA. Biafra, of course, is an ideology that no force on earth can stop according to Dim Ikemba Odumegwu Ojukwu; because, it is ordained by Chukwuokike Abhiama the most High God. Wole Soyinka regurgitated same words of Ojukwu that an ideology cannot be defeated, but Buhari the illiterate who has vowed to commit suicide inside the ocean than let Biafra go is yet to understand this fact. It is only a mad man who will boast of stopping a people from retrieving their heritage which was stolen from them. All the resources channeled into stopping Biafra is enough to take care of the entire Arewa and feed those suffering from kwashiorkor in various IDP camps in the north. 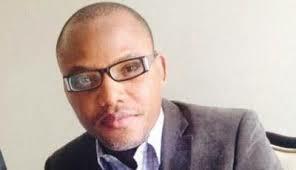 No reasonable man will embark on such a futile mission when it is clearly written that Biafra must be restored. The former governor of Adamawa state who happens to be the husband of justice Binta Nyako, stole a whopping sum of money from the state's treasury for which he is still being probed for by the EFCC. The self-acclaimed corruption czar (Buhari) who is supposed to champion his probe is very mad to assume that IPOB will allow her leader to be convicted by Binta Nyako in exchange for her criminal husband's freedom as promised her. Like Kanu rightly said, he cannot be intimidated like judge Binta and rightfully so. The plan to secretly try and convict Nnamdi Kanu will be resisted by all means. It is only a mad man that will dance naked publicly and try to cover what has already been exposed. Buhari is very mad right here! Read also: BIAFRA: EXPOSED :- BUHARI THREATENS JUSTICE BINTA FURTIVELY TO DENY NNAMDI KANU BAIL. This is the height of madness, no man in his right senses will be fighting to sustain an expired entity that has never been workable prior to her expiry date. Nigeria was proposed to expire in 2014 as stipulated in the amalgamation document of 1914, which Buhari himself is aware of. Forcing people to consume an expired product is as good as committing suicide. This unholy union is choking Biafrans and it is only a mad man that doesn't recognize when a product is expired. So In total submission to my Master’s aphorism, I hereby concur that truly “they are mad, "Buhari is mad" and the only person that can cure their madness is Nnamdi Kanu.